Part Used & Method for Pharmaceutical Preparations: The ripe fruit is gathered from October to December, then cut into slices and dried in the sun. Functions: 1. To pacify liver and regulate qi; 2. To harmonize the spleen and stomach and resolve phlegm. 1. Qi stagnation in the liver manifested as costal pain and stifling sensation in the chest. 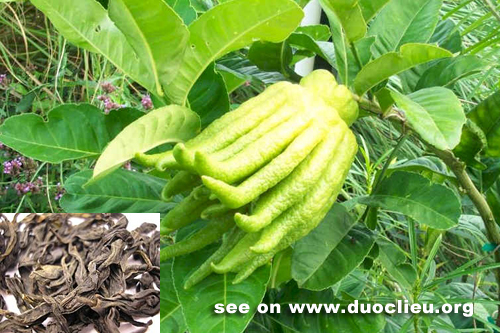 Finger citron (Foshou) is used with Cyperus tuber (Xiangfu), Citron (Xiangyuan) and Curcuma root (Yujin). 2. Qi stagnation in the spleen and stomach manifested as epigastric and abdominal distension and fullness, stomach pain, poor appetite, belching, nausea and vomiting. Finger citron (Foshou) is used with Costus root (Muxiang) and Bitter orange (Zhiqiao). 3. Chest pain and cough with profuse sputum. Finger citron (Foshou) is used with Loquat leaf (Pipaye), Vegetable sponge (Sigualuo) and Apricot seed (Xingren).